Examples of the Midnight Rule. Scary movies, candy, and playing spooky games make up our October days. My favorite game, “Ghost in the Graveyard,” was played in a nearby cemetery until someone tripped and ended up in the ER. Hopefully, your Halloween shenanigans don’t include a hospital visit - especially one that could require the Two-Midnight Rule. The Two-Midnight Rule went into effect on or after October 1, 2013, and was updated on October 30th, 2015. The rule basically says that if the provider generally expects the patient’s stay to span two nights, Medicare Part A will pay for Inpatient services. 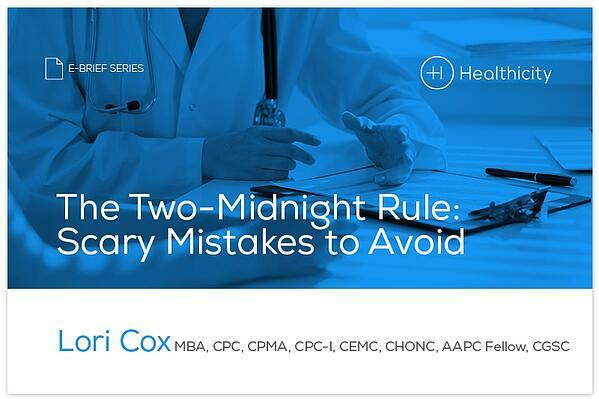 “Two midnights” means the patient’s body is in the hospital at 12:00 am for 2 consecutive nights. In instances where the patient is not expected to stay for two midnights, the patient should be considered an outpatient and the claims should be billed with an Outpatient place of service (POS) such as 22. But like many things in healthcare, there are gray areas, exceptions, and a lot of room for coding error. That’s why it’s important to get handy tips on how to avoid errors in Two-Midnight documentation.